"Had a good conversation with the children. They didn't mind the late lunch," PM Modi wrote while sharing the video. A video shared by PM Modi shows him interacting with schoolchildren in Vrindavan. 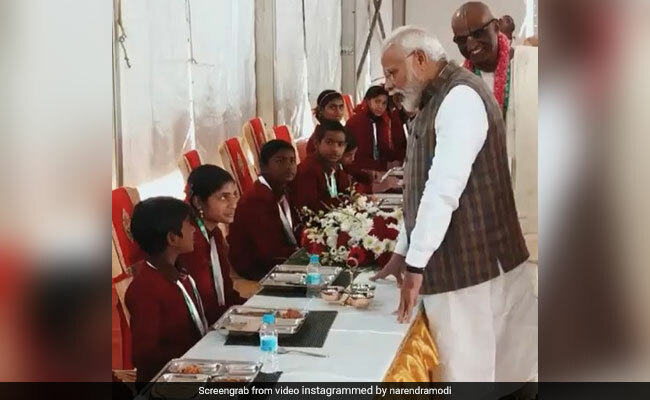 A video shared by Prime Minister Narendra Modi on Instagram shows his hilarious interaction with schoolchildren after he served food to them to mark the three billionth meal offered by Akshaya Patra foundation. PM Modi visited Vrindavan today and served food to underprivileged schoolchildren. The video shows him talking to a boy who is sitting with his classmates. "Barah baje milna chahiye tha khaana. Der se aaya Pradhan Mantri, aapka khaana late ho gaya, haina? (The meal should have been served at 12 noon. The Prime Minister arrived late and delayed your meal, right? )," joked PM Modi, addressing the boy. Before he could answer, a girl sitting next to him interjected and told PM Modi: "Hum subah khaa ke aaye the (We ate in the morning and came here)," making him chuckle. "Had a good conversation with the children. They didn't mind the late lunch :)" PM Modi wrote while sharing the video. The sweet interaction has collected over 6 lakh views and more than 2,500 comments. "You are great... The kid is smart too," wrote one person in the comments section. "The little girl came prepared with her answer," another laughed. "So cute," a third said. PM Modi also shared another video on Twitter. It shows him serving food to children. Akshaya Patra is a Bengaluru-based not-for-profit organisation that works with the government on mid-day meal schemes.